You can restore old hardware easily and put them back into service with just a little elbow grease. Any house built before 1978 may contain lead paint so take extra precaution when disturbing painted surfaces, especially around windows and doors. For a small task like this, some basic precautions will do, but for larger projects, follow the rules laid out by the EPA’s Renovate Right Program. Keep children and pets away from the room, and wear a N100 or P100 mask to prevent inhaling any lead paint. *This is not a typical dust mask it must read N100 or P100. Make sure to clean up thoroughly with a wet cloth and a vacuum to make sure there are no remaining paint chips or dust. The screws holding most of this hardware likely haven’t moved in quite a few decades, so they can be easily stripped if you’re not careful. 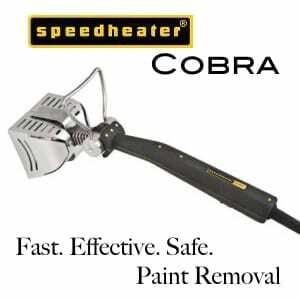 Using your flat head screw driver, carefully scrape any paint from the screw head and groove. I like to add a little Liquid Wrench or WD-40 to coax the particularly troublesome screws out. Save all the screws too! They’ll need to be cleaned just like the rest of the hardware. There are two ways to go depending on how you want your hardware to look. Make sure you clean up not only the hardware, but also the screws that will hold it in place. Boiling off the Paint – You can let your hardware soak in a simmering pot of water and baking soda for an hour or two and then wipe off the paint pretty easily with some 0000 Steel Wool. 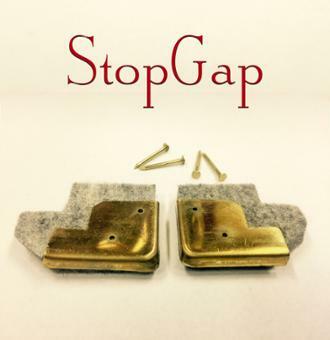 This method will maintain the aged patina of your hardware the best. This method is not a great solution if your problem is mainly rust. Wire Wheel – I prefer to use a wire wheel on a bench top grinder. The grinder cost me $40 and the wheel was another $10 and it is the fastest way to remove decades of built up paint, rust, and grime. Wear safety glasses, gloves, and your mask and once the wire wheel is spinning, just hold the hardware up to it and work all around until the surface is cleaned to your desired level. 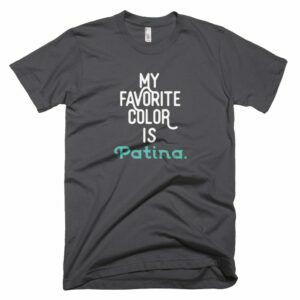 This method will likely remove any old patina, though. Stick with boiling it off if the aged appearance matters to you. Also, hold tight and be careful so you won’t have a piece fly out of your hand and across the room. Once you have cleaned them up, you may have found that you’ve removed too much of the patina on the metal and now they just look too shiny. Or possibly, you have a few pieces that needed replacements that don’t look the right color. 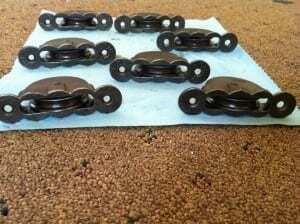 You can give them a quick soak in my hardware aging solution called The Patinator to give them that old look again. Once you have everything cleaned up, you’ll need to lubricate the moving parts. Use one of the earlier lubricants mentioned or some spray graphite. And to protect the metal from rusting (bare metal will rust quickly once exposed to air), You can use a spray urethane or varnish to protect the surface. I prefer an old-school method that I know some folks will disagree with, but it works fine for me. After cleaning I like to give the hardware a good soak in Boiled Linseed Oil. If you use this method, you need to wipe the hardware down very well otherwise you’ll have a gummed up piece of hardware once it dries. Every couple years they will need to be rubbed down with some more oil to prevent rust, but you won’t have a coat of finish to get scratched and then re-apply. Now that you know how, take a weekend and finish the whole house, conquer a room at a time, or hire a professional to do the work for you. 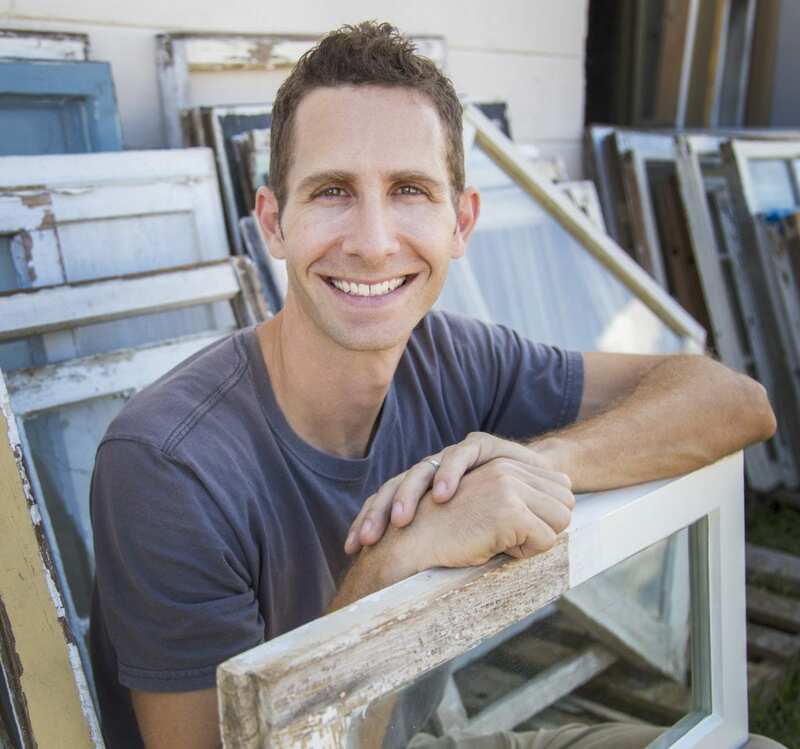 Either way, saving the original antique hardware is a worthwhile task that will retain the character of your home and function much longer than anything you can pick up at the local hardware store. I cleaned my window pulleys. They went from a beautiful bronze shade to stainless steel. I believe they were coated in linseed after talking to a few old heads, but i can not figure out how to revisit them. If i let them sit in linseed, the insides may gum up with too much excess. Do you know how and or have any advice on how to redo them with linseed? Thank you for your time. I’m restoring all the windows and door hardware in our 1924 house. I’ve had great success of the boiling in baking soda water to get all those years of paint off. But the sash pulleys rust easily afterwards. 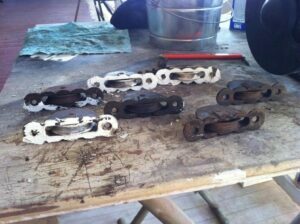 I soak them in vinegar and the still re-rust. Is this when I should do a light coating of boiled linseed oil? If we choose to paint these one day, can I paint on top of the boiled linseed oil application? Try a spray coating like BoeShield which helps prevent rust and also allows them to move better than boiled linseed oil. And you can paint over it? Thanks so much for reading and writing! I’ve used the boil technique with great success everywhere in my house (door knobs, hinges, etc. ), so I tried it again when I got to the hardware on a pair of built in cabinets. After 2 hours, the black hardware was turning silver and the water was black, so I pulled everything out and dried it off. I’m pretty sure that the hardware is original to my 1927 craftsman bungalow, but I’m not sure what I should do. Should I continue to remove the black and re-paint the hardware? Let me know if I can provide more information or pictures. It depends on the look you want, but boiling does get down to the base color of any hardware. It’s up to you! Boiling the hardware doesn’t result in any lead danger unless they are painted AND you drink the water. So your daughter should be just fine. If you are repainting then that will seal the lead in and render it safe. Love that you are repurposing an old window and commend you for getting the loose, dry paint off before you use the window elsewhere. Just be very careful when you sand lead paint. It’s best mist the dry paint and wet sand to keep the dust from flying around. 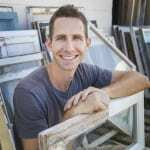 I agree with Scott that a good layer of paint or varnish will coat the remaining, likely soaked-into-the-grain lead paint. I have successfully used ammonia to get rid of paint on metal (e g brass). 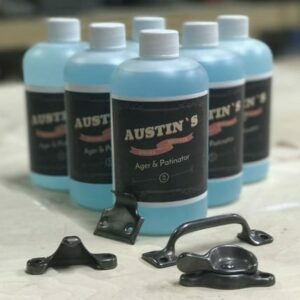 I soak door hinges, doorknob parts,etc. in a small bowl of ammonia. Works like a charm! Usually takes 3 soaks and it all has just fallen away. But, I will also try vinegar (white, I assume). LOVE your blog – site! We’ve been fixing up our 1928 bungalow for years, step by step. Your advice to save your Windows is gold-I plan to buy your book. Thank god we fought back the Pella and other window salesmen and declined to put in their inferior (and extremely expensive) replacements. BYW many Habitat for Humanity Restores and Historic Preservation community warehouses sell old sashes for a song. How about on press-fit sash pulleys? The pulley’s are held in place without screws by little “teeth.” I recently took a class and they said, leave them alone because if you take them out, you’ll destroy them. Mine are coated in paint, and I’d love to find a way to clean them up if I can. Thanks! Restoring old hardware is a tough task and you have done it fantatically i like it your products. To remove rust and old paint easily, soak the rusty hard wear in vinegar for few hours then gently brush the rust away. My husband and I couldn’t beleave how well this worked. I did this and yes, the vinegar worked great! But after I rinsed them and let them dry, they re-rusted. Is this when I should use the boiled linseed oil? Can you paint hardware after applying boiled linseed oil? And be careful how and where you dump the lead-poisoned water. It only takes a few grains or tiny chips to poison a developing child and cause irreversible damage. Check out: http://www.LeadSafeAmerica.org for lots more info and a new documentary coming out soon. Do I need to worry about lead paint during the boiling process? Will the water vapor produced be toxic to breathe? i`ve got a lot of steel details in my garage – i`d like to make use of all of them. thank u for ur site, i don`t spare i visit it.